Wut? 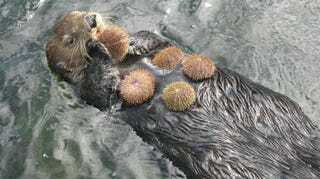 You has Tanksgibing turkie, I haz Tanksgibing urchins.....pwobwem? Yen folks, it's Thanksgiving. By the time you read this, Otter will be on the road, driving to his sisters house because she promised to make him a large batch of molasses cookies if he came for diner. And otter likes him some molasses cookies. He will not share, don't even ask. You will lose a hand if you try to take one. You have been warned. For Americans, today is Thanksgiving. For the rest of the world, it's Thursday. When I lived in Ireland, the concept of Thanksgiving was, literally, foreign to the Irish. However, there was a small town south of Limerick where I lived called Adare. And in that town was a restaurant that was popular with American and Canadians who lived in the area. (there were actually a lot of us...) It was called The Cottage Inn, because it was in a renovated house. And it had a thatched roof. (made of straw) Anyway, on Thanksgiving, the owner would host a traditional Thanksgiving meal for all the expatriates. Well, it was as close as she could get, at least. Back in 1981 you just couldn't find certain things in Ireland. Like canned cranberry goop. Or french fried onions for the green bean casserole. But she would come close. It was a good time. For those who don't know, Thanksgiving is celebrated because the original settlers in the 17th century would have died had it not been for the Wamponoag tribe helping them grow food, and teaching them to hunt the native animals and catch the native fish. Thanksgiving became a national holiday in 1863, but not as a way to remember the helpful natives. President Lincoln made it a holiday in the hopes of uniting the country during the Civil War. No one knows for sure if turkey was even served at the first Thanksgiving. The only records state the governor of the colony sent men out to go 'fowling'. And turkey was just one of the fowl they ate. They also ate partridge, dove, ducks and geese. So, turkey might have been served, but no one knows for sure. But, Thanksgiving is boring. At least, for the people not in America. For us, we get to stuff our faces with food, then watch football. If you go shopping, I don't acknowledge you. So, while today is Thanksgiving, it's also Totally Trippy Theory Thursday! It just happens to be Totally Trippy Theory Thanksgiving Thursday! This is an actual conspiracy theory that actual people actually believe. I don't believe it, but while I may be crazy, it's not that kind of crazy. Today, I have another assassination theory. On December 8th 1980, in New York City, John Lennon was shot and killed. Mark David Chapman fired 5 shots from a .38 calibre hand gun, hitting Lennon 4 times. At least, that's what you're supposed to believe. The truth, however, is different. You see, what really happened was, Presidents Nixon and Reagan had issues with John Lennon. So they hired someone to kill him. And it wasn't Mark David Chapman. No, the person they hired was a struggling author named Stephen King. Stephen Lightfoot is the man who has put this theory forward. And you know it's the truth because he will sell you a 24 page pamphlet that tells you it's true. And you know the pamphlet is true because Stephen Lightfoot is the man who single handedly got Bill Clinton elected in 1992. Need proof? Just ask him. He'll tell you it's true, so it mmust be. Anyway, you can go to Lightfoots website to get a small dose of whats in his pamphlet. And you know it has to be worth it, because I actually supplied a link in one of my posts. That doesn't happen very often, so you know it's got to be good. I would summarize it for you but, frankly, I have a hard time following it. And I can understand most dialects of crazy. The pamphlet he sells is only $5, though. I can't tell you how tempted I am to buy it. I mean, the $5 would buy him a day or two of medication, right? I know that I've said previous theories were just about as crazy as they get. This one....well, this one is right up there with the kookiest of the crazy. Seriously, follow the link and read his summary of his theory.